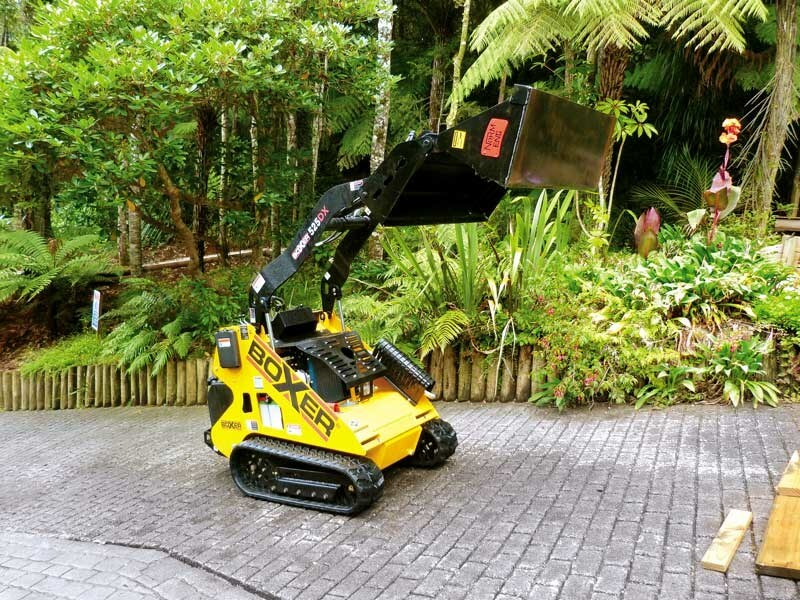 When I was offered the chance to test one of Endraulic Equipment’s Boxer skidsteer machines, I jumped at the prospect, as I could see an opportunity to kill two birds with one stone with a job of my own. 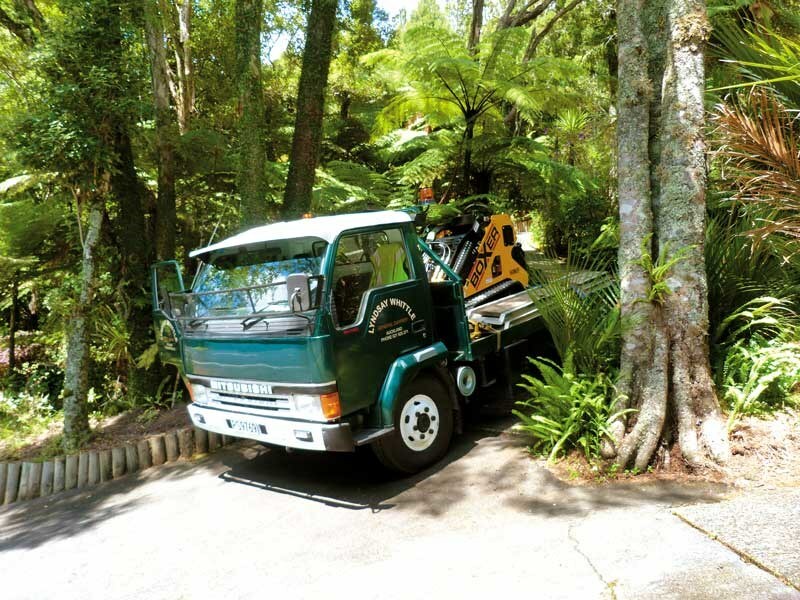 Living as I do, deep in the hills of the Waitakere Ranges, I’m always building walking tracks and gardens in the bush, and I often joke that it’s hard enough to steer an empty wheelbarrow downhill, let alone pushing a full one back up the slope. I had started digging a short track by hand a couple of weeks before, and I came to a part of the job where I could’ve thrown a day or so at digging out part of a small hill. 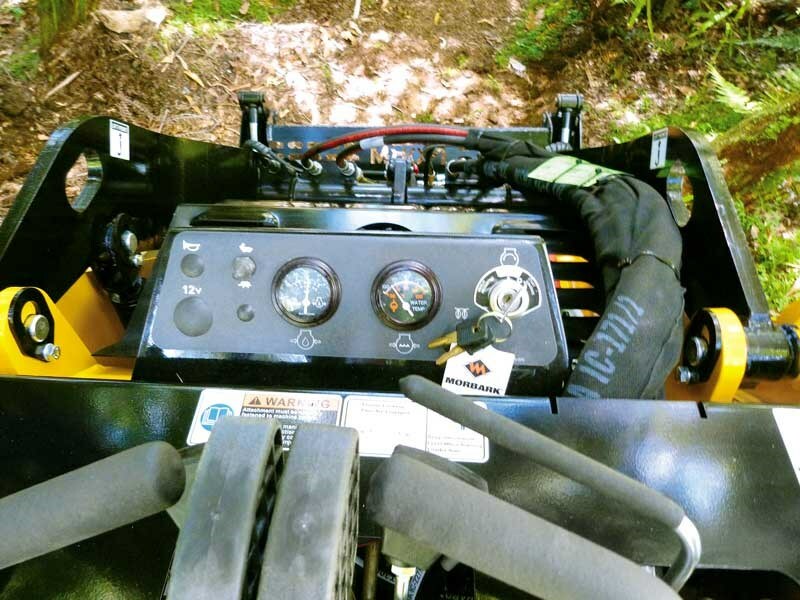 Even though the layout of the 525DX Boxer’s controls looked pretty much the same as most other brands of stand-up skidsteer machines, I was instructed to operate it in low range until I got used to it. Heeding the advice, I found the Boxer 525DX user-friendly and soon had it on the truck and ratcheted down—a job that was made easy courtesy of the Boxer’s handy rear tie-down points—and we were headed for the hills. Arriving at my property on the Scenic Drive, the machine drove down the ramps just as smoothly as it had gone up when loading, and I was impressed by the way the controls (both forward and backward) weren’t nearly as touchy as a similar-sized wheeled skidsteer I’d operated for a friend about a year or so ago. I found this smoothness of operation to be quite a treat, as I’d only been operating the 525DX for five minutes, and already, I wasn’t experiencing the jerkiness in the controls that I’d found with the other brand of machine I’d spent perhaps a couple of weeks on. Once unloaded, I had a preliminary test in mind for the Boxer and that was to see how comfortable the ride would be as I traversed my 60m-long cobblestone drive, where I had the next test for the machine waiting. As this was the first time I was operating a skidsteer with a sprung footplate, I figured the cobblestones would present the ultimate test for this clever innovation. Upon reaching the top of the drive and having travelled the distance in high range at the Boxer’s full speed of nearly 5km/h, I was pleased to be able to mark it with a score of 10 out of 10 for the low vibration test. Next was the stability test at the entry point to the worksite, so I ensured the tracks were in the expanded position. Perhaps I should explain. 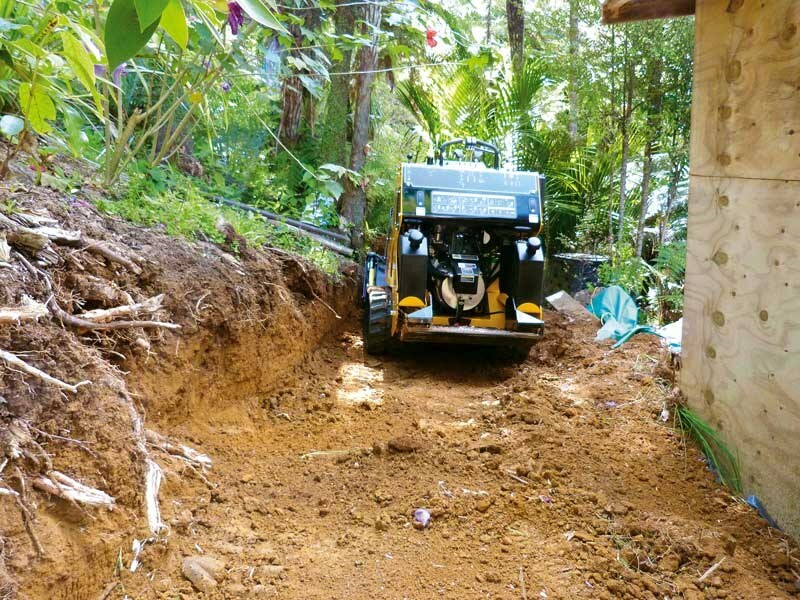 The accompanying photos don’t give a clear picture of the steepness of my drive, so the point of entry to the worksite is somewhat understated in the photo, but I can say that it is a tad over 20 degrees at that point of the incline. To add to the equation, there was a dip of about 150mm in the contour, which I knew was going to cause the front of the machine to take a nosedive, even with the bucket sitting as low as it could go. While I wouldn’t normally think twice about a dip in contour of 150mm on flat ground, when adding a 20 degree slope into the mix, I guess it does introduce a certain ‘pucker factor’. Kubota diesel engine, coupled to the hydrostatic transmission, pushed the 4 in 1 bucket through the bank like a hot knife through butter. However, while the Boxer with its 900mm-wide bucket had plenty of pushing power, it was a bit big for the tight space I had to work in, and I found myself wishing that I had a smaller bit of equipment to be working with on this particular job. Had I known what I learnt the following day that there is a smaller 3 Series machine, I would have gladly taken that option, as I didn’t need the extra power of the larger 5 Series Boxer. In any event, the job was completed in short order, and I even had enough time up my sleeve to clear a little bit for a future track I have in mind. But once again, I was conscious of not wanting to put any scratches on a brand-new machine and so I delivered it safely back to Endraulic the following day with only nine hours on the clock. I was impressed with the Boxer and found it to have as much (even more in this case) power as I’d ever need from a machine of its size. It was smooth to operate, both in propulsion and bucket operation. A combination of the configuration of the cleats on the rubber tracks and the well-sprung footplate provided an impressively smooth ride, even on my cobblestone driveway. 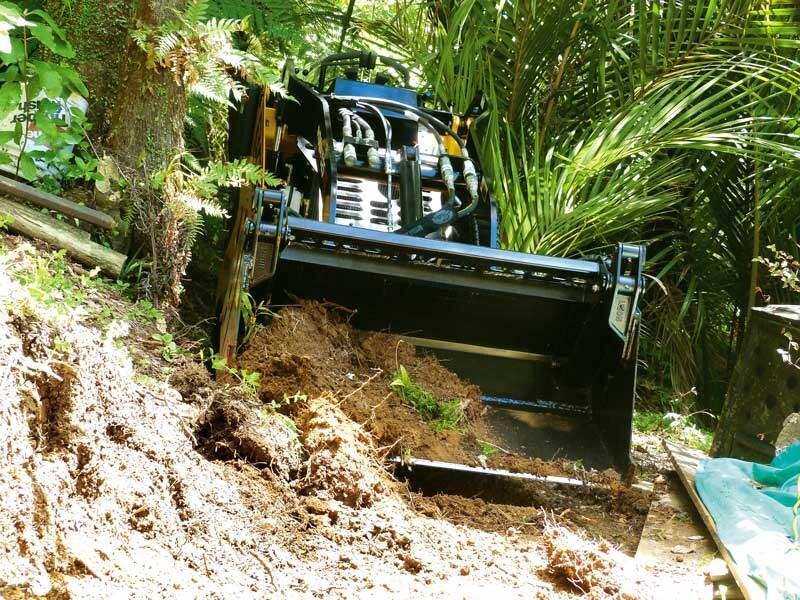 The entire machine is strongly constructed, right down to the Australian-manufactured Norm Engineering 4 in 1 bucket. 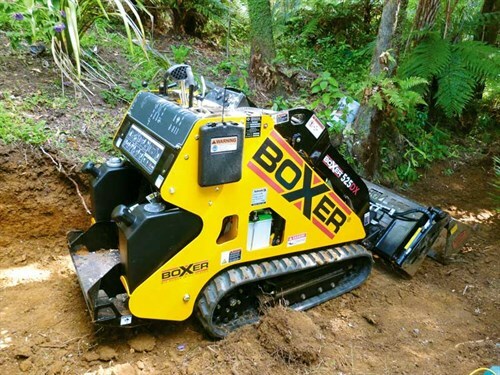 I found that the expandable tracks, when in the ‘out’ position, provided the machine with exceptional stability, while being able to squeeze the tracks inward, and when lack of lateral space was an issue, it added a further dimension to the machine’s manoeuvrability. Engine noise, even at full throttle, was quite acceptable as was the smoothness of the hydraulics. I found there was much to like about the Boxer and just one tiny thing I still hadn’t quite got my head around, even after several hours on the footplate. I found that when I was backing out from the workface with a loaded bucket, I’d often arrive at my destination with a half empty, sometimes completely empty bucket and it took me a few passes to figure out what was going wrong. It seemed that when I was reversing (never going forward), I’d inadvertently move the curved lever that operates the clamshell, and out went the load. I would say though that this is probably an unfair criticism of a machine that I simply hadn’t had enough hours on to get to know it properly. I’m pleased to report that by the time I delivered the machine back to its owners, I must’ve been feeling more comfortable at the controls, as when I was switching off the key, I noticed I’d driven the Boxer off the truck with the speed switch set to ‘high’. One of the special features of the Boxer 525DX that I liked but didn’t need to use was a push-button pressure relief valve attached to the auxiliary side of the hydraulics, which would make changing attachments a breeze. So a job that would’ve taken me a day or two by hand was done and dusted in no time at all, thanks to the Boxer 525DX and Endraulic Equipment. You both saved me a lot of hand digging and barrowing, not to mention a whole lot of calluses. 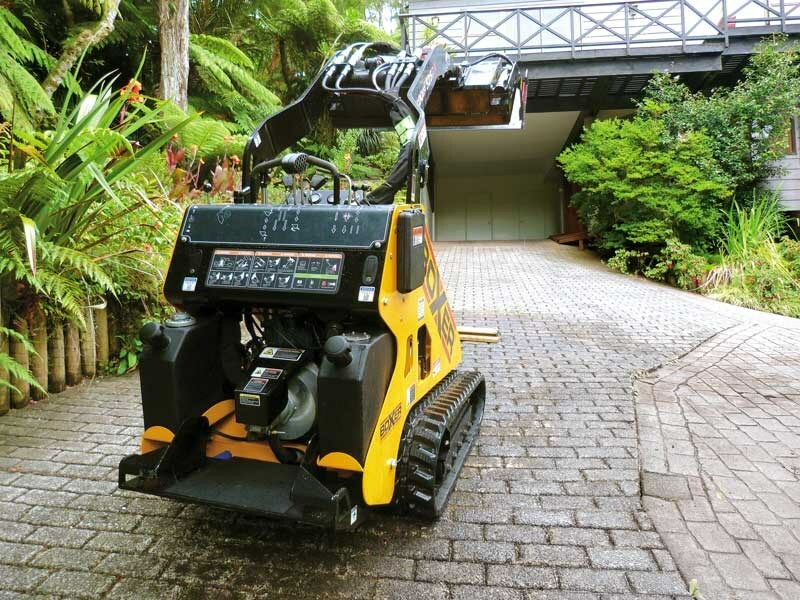 Boxer stand-up mini skidsteer loaders range from the Boxer 22HP 322D up to the Boxer 950HD powered by a 48hp Isuzu engine. For further details, contact Endraulic on 0800 468 782 or endraulic.co.nz.